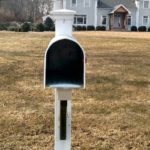 With great dismay, I note road after road of beaten, vandalized mailboxes in the past month. Sill Lane, Boston Post Road, Four Mile River Road – each and every box has been hit, my own included. This is a broken windows issue, and I offer a $1,000 personal reward to anyone our police tell me has given them information that leads to an arrest. Vandals and petty criminals need to be on the alert – Old Lyme does not put up with such behavior, and we are united as a town against them. Perhaps it is time for some Neighborhood Watch signs, unfortunately. Please alert our police to anyone you may hear bragging about this thoughtless, pointless and despicable act. 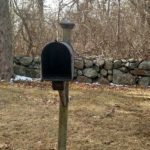 Editor’s Note: The photos, submitted by the author, show a selection of mailboxes in Sill Lane, which have been vandalized.